Franko has done it again - yet another excellent guide map in his ever growing series. This map is brand new in 2008 and features Cancun and the Riviera Maya. It is packed full of useful and up to date information, especially if you are into diving and snorkeling. 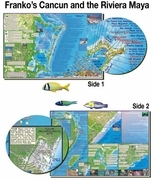 You can buy this map on-line from Caribmart.com: Franko's Map of Cancun.